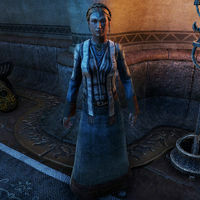 Caydeire Dechery is a Breton magus and member of the Mages Guild who can be found in their guildhall in the Canton of St. Delyn the Wise in Vivec City. "The Mages Guild has always treated me well. So I ask you, why in the world did they decide to send me to this bizarre land of bugs and mushrooms?" "I find this land … strange. I appreciate the long and cherished magical tradition, really I do. But all the insects and giant fungi? Well, to be honest, the whole country makes the hair on the back of my neck stand on end." How the Dark Elves can behave like they haven't a care in the world is beyond my comprehension. There's a damn volcano about to explode out there, not to mention a giant chunk of rock floating above our heads! How is any of that natural?" This page was last modified on 7 March 2019, at 13:02.